Are you one of those people living in Southern California, asking, “where can I find the best wasp exterminator near me?” Here’s the answer to your major wasp infestation problem: The Bee Man. Located in Orange County, CA, The Bee Man provides wasp nest removal services across residential and commercial areas in Southern California. With years of experience and training under their belts, our professional wasp exterminators can eliminate your wasp problems. There are many different species of wasps. As a result, there are different types of wasp nest removal needs. The most common species of wasps are paper wasps, mud wasps, and black wasps. They build their nests under sheltered areas, such as window sills, door frames, and the eaves of structures. You can also spot their nests in attics and behind fascia boards. Their nests are generally visible, shaped like an umbrella with a handle coming off the top and attaching to the eaves or the structure. The bottom of the nest has holes in it, which are filled with white eggs. These are commonly found throughout the United States. As the name implies, mud wasps make nests made of mud or clay. Mud dauber nests are commonly attached to tree trunks, eaves, barns, or buildings. The female wasps build the nest. They carry the balls of mud to the nest and build it. A swallow’s nest is commonly mistaken for a mud wasp nest. Please note that swallows’ nests are protected by the Federal Bird Migration Act and may not be removed until September 1st and only if they are empty. The females build underground nests that serve as nurturing centers for their offspring. Nests are typically structured in soft, well-drained soil. They are made up of long egg chambers with 2-6 paralyzed preys that serve as foods for the larvae. You can easily spot black wasp nests by observing their habits. Typically, they fly near their nest with paralyzed preys before placing them below. The black wasps are generally found along rooflines. They lay their eggs in or along the tiles or shingles of roofs. Wasps are not aggressive unless they feel threatened; however, they do not lose their stinger, and their stings can be quite painful. Wasps like to build their nests on the south or southeast side of a structure. They continue to build year after year in the same locations. Once wasps have established their territory, it could take 2-3 years to break the cycle. 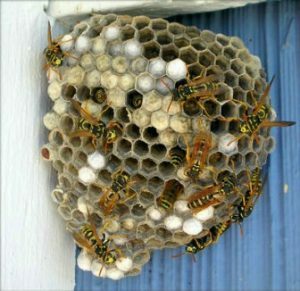 The wasp nests need to be treated and removed. The food source for wasps is the smaller bugs and insects, living on the plants and bushes in our yards and landscaped areas. Whiteflies, aphids, ants are all favorites of the wasp. In the ecological system, wasps are a benefit because they eat the insects that destroy our plants, bushes, and landscapes. The problem is that they are a stinging insect and may not co-habit well with humans. Controlling the insect population may help control the wasp population. The answer to this question is just around Southern California. Call The Bee Man, and you can trust our wasp exterminators to treat and remove every wasp nest in your property. Remember, wasp infestations can be problematic, but with the right solution, all your wasp infestation problems will be eliminated! The Bee Man is happy to be part of the solution to eliminate wasp infestations. Let our licensed wasp exterminators near your area handle all your wasp nest removal problems!